Peace of mind in real time. FollowMe Run so I'm not alone. 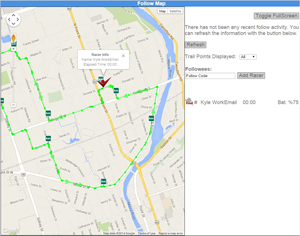 FollowMe Run is an essential tool for your runner, cyclist, walker, mountain biker or any individual leaving home by themselves to have family and friends track their travel or watch their progress during a race. There are no new devices to carry or watches to wear. Getting started is as simple as these five steps and we will guide you through one step at a time. and up to 10 family members or friends can follow you while you run any race around the world or have peace of mind by tracking you when you train. 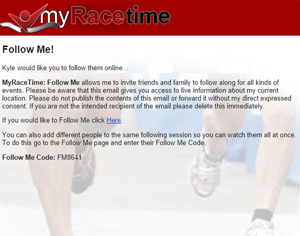 Know someone who has FollowMe Run that you would like to 'follow'? No login is required.